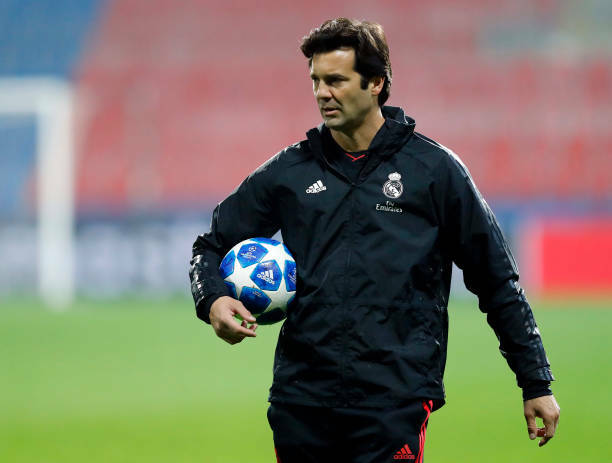 Real Madrid appoint Interim coach Santiago Solari as permanent head coach till the end of the season on Monday after his four wins in four matches since he took over from Julen Lopetegui. And with 15 goals scored and only two conceded he has established the best ever start for a Real manager.After thrashing Melilla in the Copa del Rey, they won 5-0 away to Viktoria Plzen in the Champions League, between victories over Real Valladolid and Celta Vigo in La Liga. The upturn has left Madrid only four points adrift of league leaders Barcelona and on the brink of qualification for the last 16 in Europe. Real Madrid's director of Institutional Relations, Emilio Butragueno has expressed the board's satisfaction with Santiago Solaris work with the team. “What I can say is that we are very happy with Solari.